Meine verehrten Gäste Omer Klein, Arif Ünal und ich freuen uns auf Sie! Ab dem 11.11.! My dear guests Arif Ünal, Omer Klein and me are looking forward seeing you soon! The conversation with Omer is going to be in English with german subtitles. 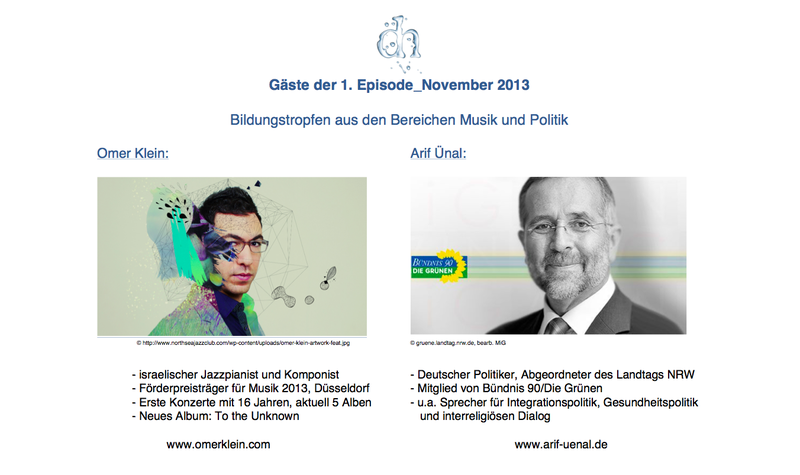 Dropwise insights into political and artistic topics with internationally known pianist and composer Mr. Omer Klein and with the member of the Landtag of North Rhine Westphalia and the political party DieGrünen Mr. Arif Ünal. Ich freue mich schon auf meine ersten Gäste und auf meine ersten Zuschauer!